While Hitler was skulking around Europe pretending to save Germany the erstwhile military minds in Washington were stonewalling womens organizations, patriotic pressures, and anyone who had the temerity to suggest that women should be in the military. The politicians, in typical gerrymandering fashion, made flimsy promises of considering an auxiliary of sorts while quietly hoping it would all go away and secretly trying to figure out how to stop it. Fortunately Congresswoman Edith Nourse Rogers and Eleanor Roosevelt thought otherwise.Congresswoman Rogers introduced a bill on May 28 th, 1941, to establish a Women’s Army Auxiliary Corps for service with the Army of the United States. By virtue of its being an auxiliary corps there was no hint of full military status for women. The bill was dissected, bisected, stalled, lost, amended, sandbagged, and all but trashed until General George C. Marshall took an interest. While several government departments cooperated, the Bureau of the Budget continued to stall in spite of pressure from Mrs. Roosevelt, General Marshall and other interested parties and groups. By late November of 1941 there was still no definitive action. At this point General Marshall literally ordered the War Department to create a womens corps. An incident in the Pacific reinforced this order. Were military women at Pearl Harbor on December 7th 1941? Military nurses were very much involved in the turmoil at Pearl Harbor on Dec. 7, 1941, working under tremendous pressure during the aftermath of the morning’s raids. The Japanese attack left 2,235 servicemen and 68 civilians dead. Eighty-two Army nurses were serving at three Army Medical Facilities in Hawaii that infamous December morning. Hundreds of casualties suffering from burns and shock were treated by Army and Navy nurses working side-by-side with civilian nurses and doctors. Nurses at Schofield Hospital and Hickam Field faced similar overwhelming numbers of wounded personnel. The Chief Nurse at Hickam Field, 1st Lt. Annie G. Fox, was the first of many Army nurses to receive a Purple Heart and the Bronze Star. Four days after the bombing of Pearl Harbor, and twenty three years after the idea of women in the military was born, the Bureau of the Budget stopped objecting, planners began to plan and cooperation suddenly became the watchword. The bill was amended, reintroduced, stuck in committees, and stalled. The search was on for a director, a training center and the appropriate equipment. The military men in charge of logistics searched for ideas for no regulations existed. Finally on May 14th 1942 the bill to “Establish a Women’s Army Auxiliary Corps” became law and Oveta Culp Hobby, wife of the former governor of Texas, was named director. While bills were being bandied around Congress, women were being trained at the first WAAC Training Center in Fort Des Moines, Iowa. With a nudge from Eleanor Roosevelt, the Navy got its act together and began authorizing a Womens Naval Reserve and the Marine Corps Womens reserve. The Coast Guard followed soon after. The first director of the WAVES – Women Accepted for Volunteer Emergency Service – was Lt Commander Mildred McAfee, President of Wellesley College. The SPARS, which came from the Coast Guard motto Semper Paratus – always ready, were led by Lt Commander Dorothy C. Stratton. The Marine Corps Womens Reserve was headed by Major Ruth Cheyney Streeter. The WAAC was changed to the WAC establishing it as a part of the Army and not an auxiliary by a second bill in July of 1943, signed in to law by President Roosevelt. Women in the military were becoming a reality. While all this politicking was going on the first WAAC contingent was serving at the Allied Forces Headquarters in Algiers, North Africa. By January of 1944 the first WACs arrived in the Pacific and in July of 1944 ,WACs landed on the beach at Normandy. There were over one hundred thousand women in uniform at this point in time. Nurses were already serving in England and Egypt. Women continued to serve overseas through 1945 and at one point there were over 2000 WACs serving in North Africa alone. From there women were sent to Italy to serve with the 5th Army and these women moved all over Italy during the Italian campaign handling the communications; they earned commendations, bronze stars and the respect of their fellow soldiers as they sloughed through mud, lived in tents, dived into foxholes and dugouts during the Anzio air raids. During the battle on Anzio, six Army Nurses were killed by the German bombing and strafing of the tented hospital area. Four Army Nurses among the survivors were awarded Silver Stars for extraordinary courage under fire. In all, more than 200 Army Nurses lost their lives during World War II. Toward the end of the war in Europe the European Theater boasted over eight thousand WACs stationed across England, France, and Germany in cities like Berlin, Frankfurt, Wiesbaden, and Heidelberg. If you’re wondering where were the women of the Navy, Marines and Coast Guard, ironically regulations did not permit them to serve overseas until the war was almost over. But Navy Nurses were serving on board hospital ships, in air evacs, and every place from Australia to the Pacific. As the war escalated in the Pacific, women were sent to New Guinea, Leyte, and Manila in the Philippines, as well as the China-Burma-India theater. Over 5000 women served in the Southwest Pacific area. Army nurses served throughout the Pacific in increasing numbers between 7 December 1941 and the end of the war. Nurses were stationed on the islands of Guadalcanal, New Guinea, Saipan, Guam, and Tinian. Often ignored by history is the story of the women prisoners of war taken captive during World War Two. Sixty seven Army nurses and sixteen Navy nurses spent three years as prisoners of the Japanese. Many were captured when Corregidor fell in 1942 and were subsequently transported to the Santo Tomas Internment camp in Manila, in the Philippines. Santo Tomas was not liberated until February of 1945. Five Navy nurses were captured on Guam and interned in a military prison in Japan. Here is a rare WWII poster featuring the Nurses on Corregidor in a Japanese POW camp. One seriously doubts that they would be in whites with red and blue capes while prisoners but the point was being made to appeal to defense workers. Two days after the bombing of Pearl Harbor, 5 Navy nurses on Guam were taken prisoner by the Japanese. Lieutenants (jg) Leona Jackson, Lorraine Christiansen, Virginia Fogerty and Doris Yetter, under the command of Chief Nurse Marion Olds. Later in 1942 their captors transported them to Japan. They were held for three months in Zentsuji Prison on Shikoku Island and were then moved to Eastern Lodge in Kobe. They were repatriated in August of 1942. Nurses received 1,619 medals, citations, and commendations during the war, reflecting the courage and dedication of all who served. Sixteen medals were awarded posthumously to nurses who died as a result of enemy fire. Thirteen flight nurses died in aircraft crashes while on duty. Sixteen women received the Purple Heart , awarded to soldiers injured due to enemy action. The Bronze Star was awarded to 565 women for meritorious service overseas. Over 700 WACs received medals and citations at the end of the war. Countless women served in all branches of the service stateside and relieved or replaced men for combat duty overseas. Women performed admirably in every conceivable job imaginable including the dedicated WASPS who flew military aircraft to destination bases, suffered casualties, and yet were denied full miltary status. However, with demobilization thoughts of women as an integral part of the miltary were not on the minds of the powers that be… even though four hundred thousand women gave a part of their life to their country… suffering not only the hardships of war but the cutting edge of public opinion. 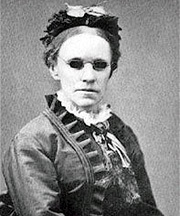 Fanny Crosby was born in a one-room cottage in New York. Her father died when she was a year old, leaving her mother and grandmother to raise her. Though she was born seeing the world around her, at six weeks old she lost her sight. The family physician was away, and a country doctor was called in to treat a slight cold in her eyes. He prescribed mustard poultices. By the time Fanny’s mother found out that he was not qualified to practice medicine, he had disappeared. How would she achieve her purpose without an education? Fanny’s grandmother became the girl’s eyes, describing the beauty of the world. She also introduced her granddaughter to the Bible. It is said that, as a child, Fanny could repeat from memory the Pentateuch, the book of Ruth, the book of Proverbs, Song of Solomon, much of the New Testament, and many of the Psalms. At age fifteen Fanny’s mother told her that she would attend The Institution for the Blind in New York City. “O thank God,” Fanny cried joyfully, “He has answered my prayer, just as I knew he would.” Fanny was a student there for twelve years, and taught there for eleven more years. Thou art smiling, Do not pass me by. Kneeling there in deep contrition, Help my unbelief. The Lord did not pass Frances Jane Crosby by. Inspired by God’s guiding light, she died with over 8,000 hymns to her credit. The study and practice of medicine is . . . but one means to . . . the true ennoblement of woman, the full harmonious development of her unknown nature . . .
As the nineteenth century dawned it became more and more difficult for women to be involved in the medical arts. The herbalists and midwives of the villages began to disappear as more and more people migrated to the cities. Dispensing of medical advice or treatment evolved into a male dominated profession. 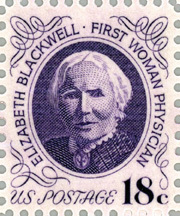 Through courage and determination Elizabeth Blackwell forced open the doors of medical training for women. These doors would never be closed again. Elizabeth was a “guiding star…to rebellious women everywhere.” After years of frustration and effort, she became the first woman to receive a fully accredited medical degree. Why did she do it? The defining moment of her life came when a family friend was dying. Elizabeth went to visit her, and her friend confided her humiliation at having to be treated for such personal issues by a man. Something stirred inside Elizabeth, and her desire to be a physician was strongly attached to her compassion for this woman’s suffering. After graduating from Geneva (now Hobart) College in 1849, she then went to Europe to study. When she returned she opened the first free clinic in New York City specifically for the medical needs of indigent women and children. Soon Elizabeth realized that this need was overwhelming. Her clinic was full and there weren’t enough hours in the day to treat everyone who needed her. She closed her small clinic and opened the much larger New York Infirmary for Indigent Women and Children. This was a hospital, not a clinic, and it had facilities for many more patients. Eventually the hospital became a training school for female medical and nursing students. It was a tremendous success, and it exists to this day as part of the New York University Hospital System. It’s hard to deal with the loss of a loved one, especially when that loved one is your child. “You either run to God or you run from God,” says Kevin. In Journey through the Loss of a Child, Kevin and Dawn and Bob and Chris share their personal stories about the loss of their sons to encourage other parents and point them to the light of God’s presence that brings peace and hope. In Journey through the Loss of a Child, Kevin and Dawn and Bob and Chris share their personal stories about the loss of their sons to encourage other parents and point them to the light of God’s presence that brings peace and hope. That was a chilly Winter morning on the 12th of January, 2007..Standing quietly in one corner of the ever busy “L’Enfant Plaza” subway station in Washington, D.C. a Violinist, wearing a baseball cap and blue jeans, was playing his Violin.. Displaying amazing talent in playing solo, the Violinist gave a truly incredible performance there, at the subway, for about forty-five minutes.. And this is what has happened..
During those forty-five minutes of musical extravaganza..
During those forty-five minutes, about 1097 commuters passed through that station with literally none of them paying any attention to that mind soothing music from the Violinist.. However, during the third minute of the performance, a middle-aged man noticed that a Violinist was performing there in that busy subway.. This man just paused there; looked at the Violinist for a few seconds and then moved away to attend to his daily work.. 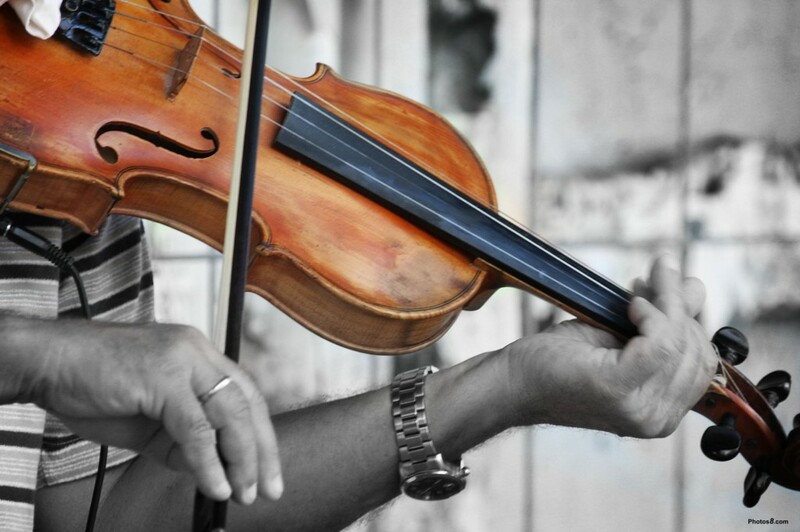 In the fourth minute – the Violinist received the first tip of the day from a lady who had thrown a one dollar bill into the Violinist’s till and quickly moved away without even noticing who that amazing Violinist was.. In the eighth minute, a man leaning against a pillar – that’s there a few yards away from the place where the Violinist was performing – started observing the Violinist’s performance..
That man too quietly observed the Violinist just for a few seconds; later looked at his watch and quickly walked away from that place without bothering to pay any further attention to that amazing performance of the great Violinist..
only six among the 1097 commuters paused in front of the Violinist for a few seconds and later briskly moved away..
Only twenty out of those 1097 commuters have donated some cash to the Violinist but they too were not bothered to know whom they are donating to and who that great Violinist was…They just moved away quickly without even stopping and looking at the face of the great Violinist..
All that the great Violinist received, for his forty-five minutes of some mind-blowing musical performance there at the subway station, was a meager thirty-two dollars. 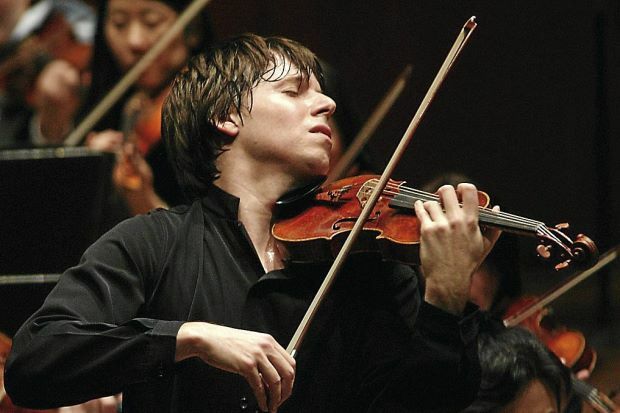 There was an echoing silence all around the subway station, when the violinist suddenly stopped playing his Violin… But none of the busy commuters passing through the station noticed that sudden silence in the air nor anyone applauded in appreciation of the Violinist.. But unfortunately..
None of those busy commuters there knew..
That they have just watched one of the world’s most talented and the most amazing Violinists named “Joshua Bell” – who became a child prodigy after performing at New York’s Carnegie Hall, at age seventeen, in 1985 – playing in front of them, at the subway, (was) some of the most intricate set of six works called Sonatas and Partitas, on his solo Violin..
None of those commuters there know that the Violin, on which the great Violinist had performed, was a four hundred year old Violin; and to which the great Joshua Bell had actually paid a whopping 3.5 million dollar to a thief on his deathbed..
None of those 1097 commuters there know that just a night before that performance in front of them at the busy subway station, the amazing Joshua Bell had given a live performance at a popular Boston theater, to a packed house, with each ticket there sold for a minimum price of one hundred dollars.. Finally, none of those subway commuters there know that the great Violinist, Joshua Bell, who had performed in front of them at the busy subway station, was part of a unique experiment Gene Weingarten, of Washington Post, was conducting there to measure the exact amount of time people actually spend to pay attention to such beautiful things happening in and around them on a busy day.. There were many hidden cameras there in the subway station, capturing each and every moment of Joshua Bell’s performance and the movement of the commuters there in the subway, but neither the commuters nor the great Joshua Bell know about it.. Later when Gene Weingarten presented these subway findings in his book “The Fiddler In The Subway,” the book won him a well deserved Pulitzer Prize…. Our life is always about many small things and little pleasures which may seem very meaningless and impractical when we are busy pursuing our goals… However, by the time we reach our goals and accomplish our tasks it will be too late for us to realize what we have thus far lost in our life.. If we always keep the eyes of our mind wide open then there are many amazing things in this beautiful world waiting to give us enough reasons to smile.. And music is certainly one among them..